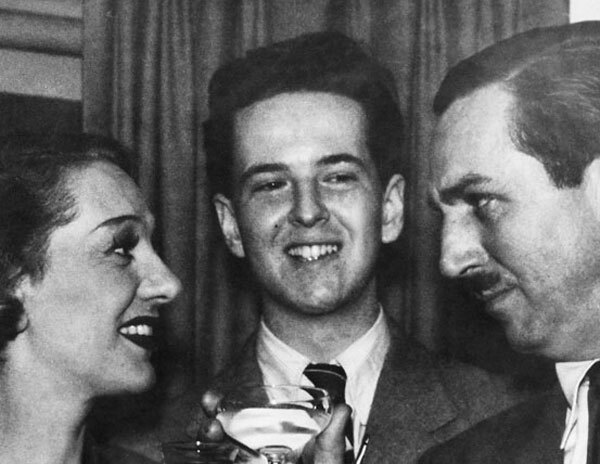 On April 19, this blog posted “A Tale of Two Gerties,” illustrated by two never-before-seen photographs of Walt Disney and Broadway star Gertrude Lawrence (nicknamed “Gertie” by her close friends). The photos were taken on February 7, 1942 backstage at the Alvin Theatre during the run of Lady in the Dark, the hit musical play in which Ms. Lawrence starred. In one of the photos, grinning joyfully between Walt and Gertie, is a 17-year old self-taught, would-be animator named Robert N. Brotherton. In the late 1940s, Bob Brotherton rescued from destruction original negatives and prints of several films created by the great comic strip and animation pioneer, Winsor McCay. Bob also played an important role in the life of another star performer named Gertie. This was McCay’s celebrated 1914 animated cartoon dinosaur, who possessed the personality of a petulant child. 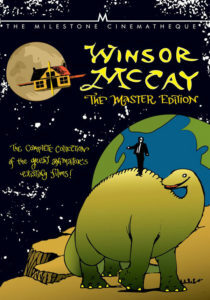 The naturalistic design and motion of McCay’s cartoon dinosaur predict Disney’s “illusion of life” personality animation by twenty years; also, McCay’s live interaction on stage with the film of his “trained dinosaur” is a superb example of early multi-platform, immersive entertainment. 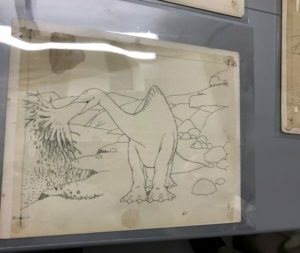 Not only did Bob Brotherton save Gertie film prints and negative from oblivion, but he rescued and preserved a goodly number of McCay’s original Gertie animation drawings. Of McCay’s known ten films, only the Gertie drawings on rice paper and a few cels (drawings on celluloid acetate) from his 1918 masterpiece, The Sinking of the Lusitania, are known to survive. In my 1987 biography, Winsor McCay – His Life and Art, I wrote briefly about Bob and his heroic efforts. But he has never received enough credit for his extraordinary salvaging and protection McCay’s animation legacy. Practically nothing been written about the life of this man who, in his own way, had the passion for film preservation and tenacity of Henri Langlois. 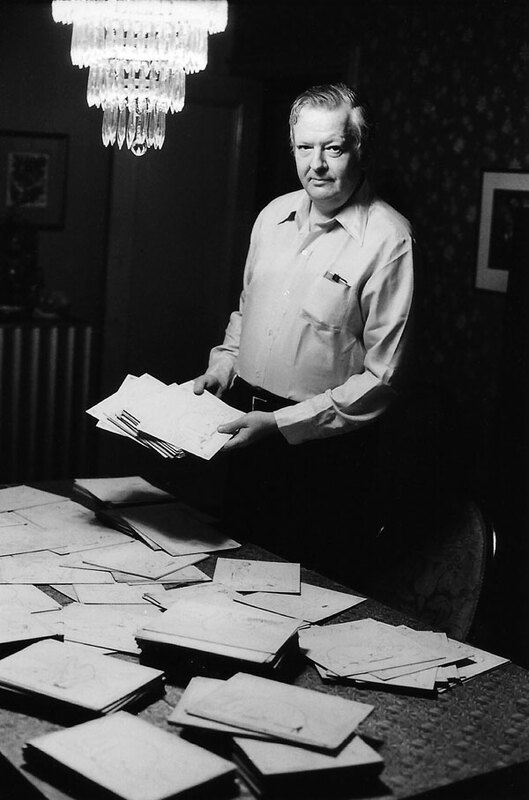 Bob Brotherton at home in New York in the mid-1970s, with original Gertie the Dinosaur drawings. Although Bob Brotherton grew up around theatre people, his talent for drawing led him at age 14 to make his own animated movies using a 16mm stop-motion Bolex camera. In 1943, at age 18, he left college to join the Armed Forces. In June 1944, he fought in the invasion of France at Utah Beach; in July, he was wounded during a critical battle at St. Lô. After hospitalization in England, an Army agency placed him in a special GI program “Training with Civilian Agencies,” which prepared soldiers for a return to civilian life in the USA in a chosen field. In 1945, through Max Milder, a family friend who headed Warner Bros. International, Bob became the only GI in the United Kingdom Theatre of Operations to study and train for a film career with Associated British Pictures. For nearly a year, Bob was trained by English director Harold French, and learned cinematography techniques from Freddie Francis of the B.S.C. (British Society of Cinematographers). He also observed the production of five features in British studios before his 1946 discharge from the Army. Back in New York, Bob studied at the Art Students’ League, and in 1947 worked briefly as a staff artist at Timely Comics (later Marvel Comics Group) on comic book art for Patsy Walker and Comedy Comics. In late 1947, 22-year old Brotherton and Arthur L. Goldman formed Television Cartoons, Inc., which produced hundreds of animated and live-action advertisements for Vaseline Hair Tonics, Hudson Autos, Sylvania Electric, Blatz Beer, US Bureau of Aeronautics, Four-Way Cold Tablets, among other products and services. The firm started in a downtown (SoHo) loft, later moving to larger quarters on West 46th Street. The corporation closed in 1953, according to Brotherton, “due to the actors/agency strike that closed many film companies during the period.” By that time, he was a member of the Screen Directors International Guild and the Director’s Guild of America. Also, in 1953, Brotherton joined CBS News as a staff film editor, making an eventual switch to editing on videotape. In 1970, he took a leave of absence from CBS for nearly eight months to become involved, like his father, in the production of a Broadway show. The ill-fated musical played nine previews and closed opening night. He returned to CBS and was employed there until his death in 1989 at age 64. 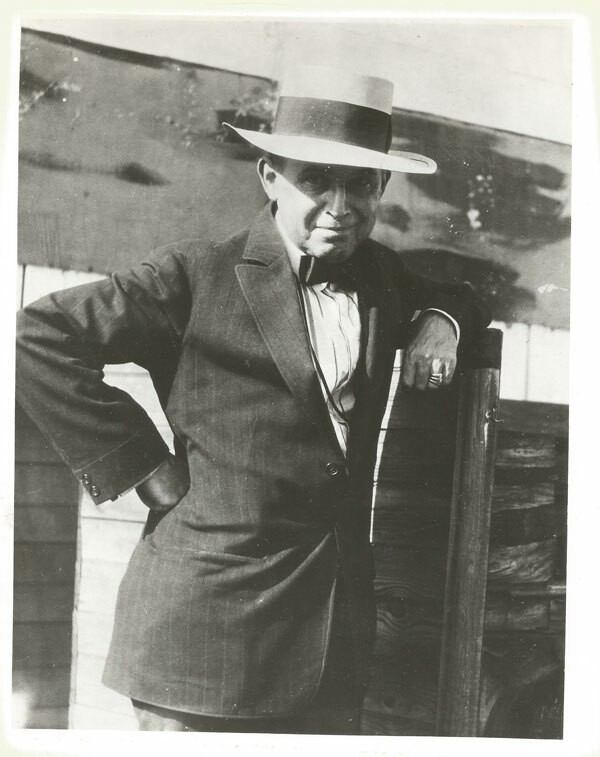 Winsor McCay in his later years, circa 1930. Winsor McCay’s film legacy had already passed through a number of hands before Bob Brotherton became involved. In July, 1934, McCay died suddenly of a cerebral hemorrhage at his home in Sheepshead Bay, Brooklyn. He was 68 years old and still working full-time as an editorial cartoonist for William Randolph Hearst. The McCay house was filled with hundreds of artworks from his long career, including original panels from his comic strips Dreams of the Rarebit Fiend and Little Nemo in Slumberland; many of his editorial drawings and advertising illustrations; original animation drawings from the dozen or so short films he created between 1911 and 1922, and 35mm nitrate negatives and prints of these films. These objects remained in the house until the late 1930s, when a fire in the living room damaged some of the drawings and films. McCay’s widow, Maude, decided to give up the house and move to an apartment, and their son, Robert, agreed to take the entire collection to his house for storage. But he did not have space for everything, so he culled the contents of some film cans and burned them in the Brooklyn city dump. Eventually, Robert transferred the collection to a trusted McCay family friend, Irving Mendelsohn. 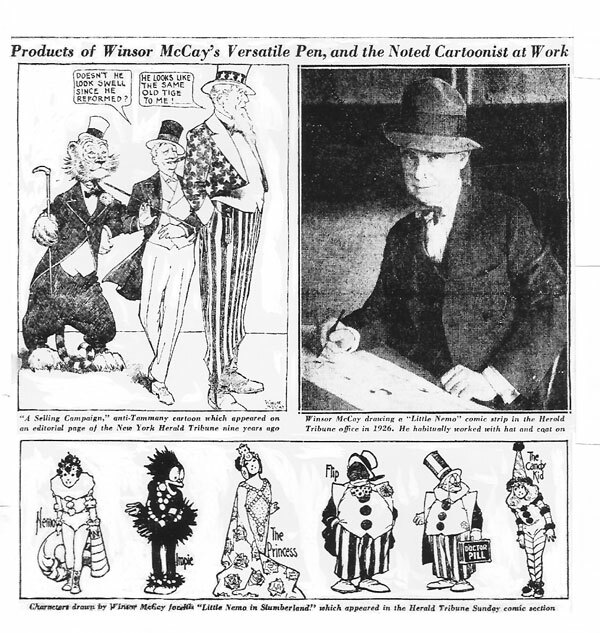 Mendelsohn was a fabric salesman and longtime admirer of McCay’s work. He befriended McCay in the later years of the artist’s life, probably in the late 1920s. “I was just an admirer of his. Just one of the public,” Mendelsohn told me in an interview on August 8, 1974 in his fabric loft on West 38th Street in New York City. Throughout his career, McCay had always earned top dollar, but spent lavishly on a very comfortable lifestyle for his wife, children and grandchildren. New sources of income would always be welcome, and Mendelsohn agreed to help McCay find additional work. We had a paper competitive to Hearst’s Evening Journal. When Mr. McCay was very unhappy, I figured I would go to them since I had the right to represent him. So I went over to Park Row, that’s downtown in the City Hall area …and I met one of the men to talk. He said, “Why we’d love to have Winsor McCay. Love to. [But] Mr. Hearst would put us out of business if we took him…away. After McCay’s death, Mendelsohn continued his friendship with the family. In the mid-1940s, he and Robert McCay formed the McCay Feature Syndicate, Inc. and attempted to interest the Richardson Feature Syndicate in a revival of McCay’s famous strip, Little Nemo in Slumberland. The attempt was mercifully brief, but not before Robert cut and trimmed panels from several of his father’s original large-size Nemo strips to fit a modern smaller format, a ghastly mutilation of art difficult to contemplate. 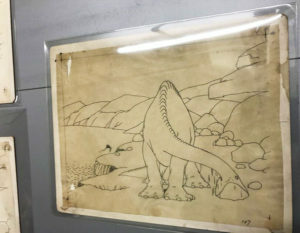 Above, and below right, two of Winsor McCay’s original Gertie the Dinosaur animation drawings that have been preserved at the Billy Ireland Library & Museum in Columbus, Ohio. Photos by Mark Osborne. Click images to enlarge. Robert McCay subsequently relocated his family to California. Having failed to find any way to exploit his father’s original art, he left the bulk of it in Mendelsohn’s care, along with the film materials and animation drawings, which had essentially no commercial value. Mendelsohn carted the artwork and films from Brooklyn to his fabric loft (then on White Street) in Manhattan, and finally to his home on Long Island. In 1947, Mendelsohn’s son Jack (1926 – 2017) — then a 21-year old writer-artist who later worked on TV comedy series and was a screenwriter on Yellow Submarine (1968) — brought to the Long Island house a young friend named Robert Brotherton. These were old 35mm nitrate films. [The earliest was thirty-six years old.] When that stuff deteriorates, it first turns to jelly, then to powder, and then watch out — it explodes! It’s highly flammable, so I asked Irving to fill a barrel with water. All afternoon and part of the next morning I looked through every can. Most were rotten and I threw those immediately into the waterbarrel. I managed to save around sixty cans. Most were prints of Gertie, but there were examples of all of McCay’s animations represented, including the hand colored Little Nemo. Some films, like the second Gertie [Gertie on Tour], I could only save a small amount of footage and a few representative frames. One discarded film was “an original negative to a film entitled Performing Animals. Hand-examination showed that the animals were playing musical instruments,” recalled Brotherton of a film that may have been a test of a planned cartoon for McCay’s vaudeville act. “In connection with this negative, there was an incomplete positive reel in a very early stage of decomposition.” Both were destroyed. A hand-colored version of Little Nemo, McCay’s first film made in 1911, based on his epic Little Nemo in Slumberland comic strip, was mercifully saved. Thus began a twenty-year tragicomic odyssey in which Mendelsohn and Brotherton were thrown out of editing rooms and storage houses when it was learned the film treasures they were tending were made of nitrate. In the middle of the amateur conservators’ misadventures, a tribute was paid to Winsor McCay on national television. A 1955 the Disneyland television show recreated McCay’s vaudeville act, where he “performed” onstage with his animated creation, Gertie the Dinosaur. 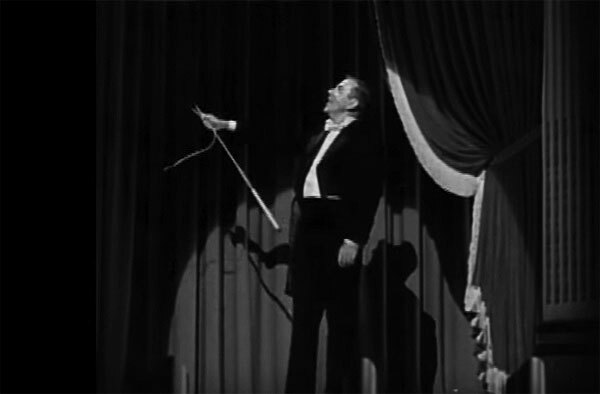 Writer/animator Richard Huemer had witnessed McCay’s act years before in New York, and, with Robert McCay acting as the segment’s consultant, he was able to reproduce for the actor who played McCay the exact dialogue and movements of the artist (cracking a whip, tossing a fruit, and so forth). This historic overview of the history of character animation was the first time a new generation had ever heard of Winsor McCay and Gertie the Dinosaur. The 1967 World Animation Film Exposition in Montreal and La Cinémathèque Québéçoise tracked down the McCay films and offered Mendelsohn and Brotherton the chance to have the troublesome nitrates preserved on safety film and stored properly. This the two men gratefully allowed. And so the existent 35mm filmography of Winsor McCay resides today in Montreal at La Cinémathèque Québéçoise. They are distribtuted on DVD by Milestone Film & Video. In the early 1960s, Mendelsohn returned the original McCay comic strips and related paper drawings to Winsor McCay’s daughter Marion. Her brother Robert died of cancer in 1962. Irving wanted to give me a gift for helping him with the films. So he told me to go up to the loft of his fabric shop on White Street. There on the floor — I’ll never forget it — strewn from one end of the loft to the other among bolts of fabric, were all these Gertie drawings. Irving said to take whatever I wanted, so I spent the entire afternoon picking up every one. 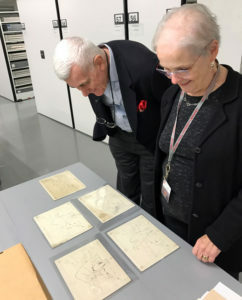 John Canemaker and Lucy Shelton Caswell, Founding Curator of the Billy Ireland Library & Museum in Columbus, Ohio, examine the Museum’s collection of “Gertie” animation drawings. Photo by Mark Osborne, taken Oct. 14, 2016. Bob carefully preserved the delicate drawings for nearly three decades, selling some to private collectors, and also donating some to museums, such as La Cinematheque Quebecoise, MoMA, and the Billy Ireland Cartoon Library & Museum, among other venues. I met Bob Brotherton through Louise Beaudet, then head of the animation division at La Cinematheque Quebecoise in Montreal. At the time, I was beginning to research Winsor McCay and people who knew him, which eventually led to my writing the cartoonist’s biography in 1987. My first interview with Bob took place on July 29, 1974 at his editing room at WCBS studios on West 57th Street on the night shift. I later conducted interviews with him at his mother’s apartment on West End Avenue and 76th Street. He was divorced at the time with a young daughter who lived with her mother in the midwest. Bob later married Heneriette (Betty) Adam, a vivacious French woman who brought great joy to his life. 1. This piece fills in most or all of the questions we (the Gertie Project) had about the provenance and preservation of the nitrate prints. 2. Heartbreaking words: “…burned them in the Brooklyn city dump.” Of course, we should be grateful for what we have. 3. I didn’t know (or didn’t remember) the connection between Irving and Jack Mendelsohn. 4. 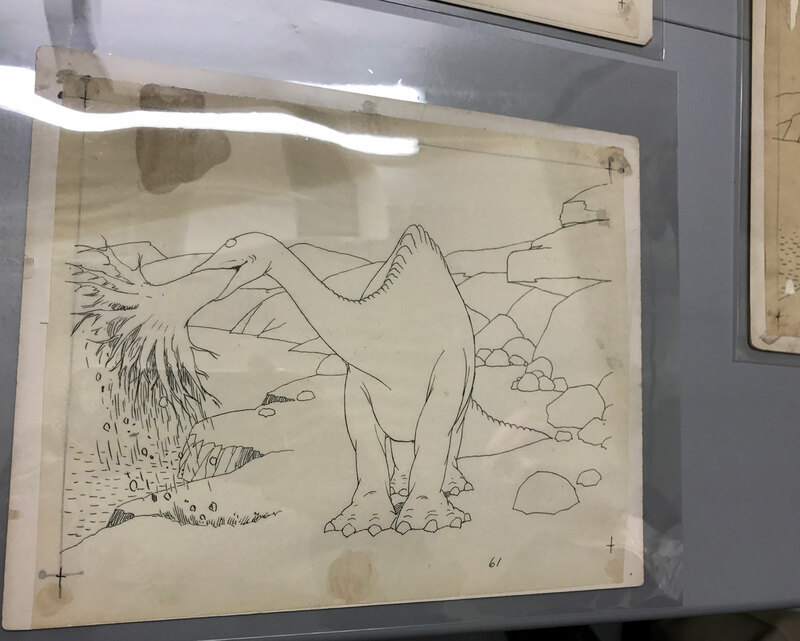 The Gertie Project already has copies of the two drawings in this post, and they are among the ~350 drawings known to us through the efforts of Bob Brotherton and Irving Mendelsohn. Thank you for your tribute to Bob Brotherton. I worked with Bob for a few years when I began my career at CBS News in 1972. He was an editor in the department where I started up the production ladder. He was a wonderful man. We talked a lot about many things, but he never once mentioned what you have written about him here. The only part of his past career that he brought up was the musical that closed on opening night. He was a modest guy and a loving father. I left New York in 1978 to take a new job in Los Angeles. I would see him when I returned a couple of times but we fell out of touch. With the advent of the internet I tried tracing him down to no avail. Today I decided to look again and found your tribute. Thanks so much.